Sometimes I think about what my life would have been like if I’d taken different roads. Know what I mean? Like, what if I did decide to go to New York for college instead of Minnesota? What if I actually did pursue a career in anthropology instead of journalism? What if I didn’t go to that show on a cold Saturday night my junior year so I could finish my research paper and not meet my future husband? What if I ate tacos last night instead of enchiladas? I bet if things happened differently, I probably wouldn’t be writing to you here. I probably wouldn’t have discovered how much I love being here, sharing recipes and stories with you. 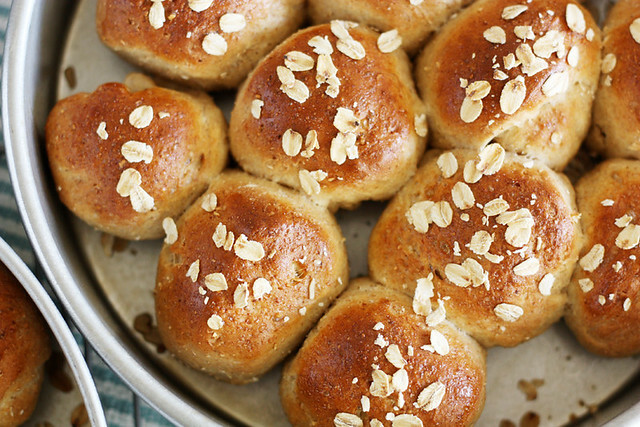 And I probably would never have known how delicious these oatmeal pan rolls are. Seriously, though — admit it. More often than not you buy the store-bought rolls for your holiday dinners, either baked or pre-baked so you feel like you actually made them (Guilty, party of one right here). I get it. I really do. When you’ve got a roast or a honey ham, sweet or mashed potatoes, green bean or baked bean casserole, apple or pumpkin pie and Christmas cookies (or in the case of my family, ALL OF THE ABOVE) to think about, the last thing you want to do is tackle a yeast bread recipe for rolls. Because rolls tend to take a backseat to the rest of the spread, anyway. They just hang out in the corner, probably tucked into a tea towel-lined basket, just sitting there all warm and lonely and ready to be eaten. And usually a couple of people grab for them, slather them in butter or make sandwiches with them using everything else on their plates (like my husband) and they’re soon devoured and forgotten. Now I’ve made you feel guilty for leaving those poor rolls high and dry. Or maybe it’s just me who projects emotions onto food. (And onto my childhood teddy bear. I just know he’s pretty pissed that I’ve stored him in the closet). ANYWAY, as I was saying… these rolls are different. They don’t really smack you in the face with flavor, but the ground oats give enough texture and sweetness to the rolls that they make you pay attention. You can make them way ahead of time (like say, today), freeze them and warm them back up in a few weeks for the feast. And you can also feel good knowing you made the rolls happier — I mean, made your own rolls instead of impostor ones. Because if you didn’t make these rolls, who knows what would have happened. At least you’ll know now that the holidays will be a little bit tastier. 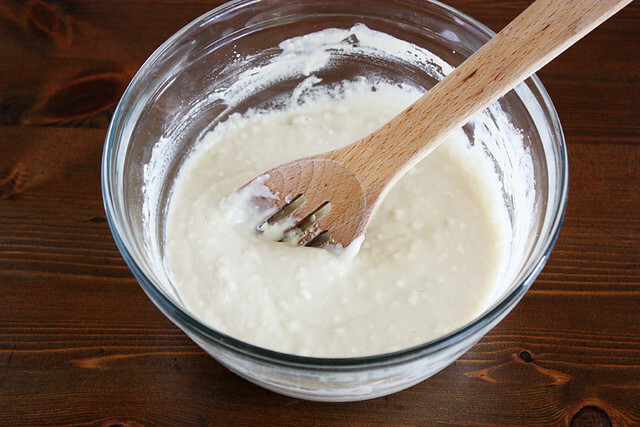 In a medium bowl, whisk together yeast, sugar, 1 cup all-purpose flour and milk. Cover with plastic wrap or a towel and let rise until doubled, about 1 hour. 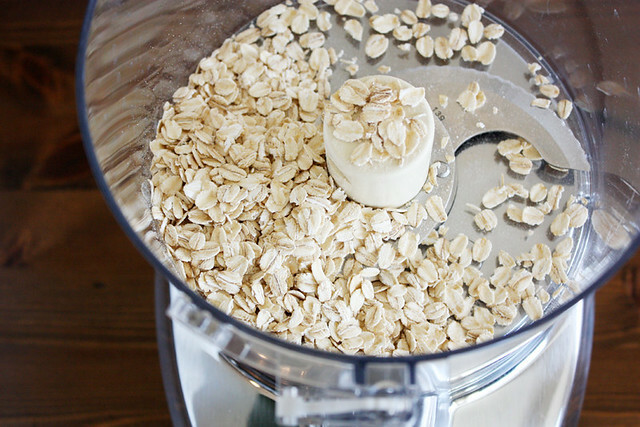 Pour 1/2 cup old-fashioned oats into a food processor; pulse until fine-ground. Pour ground oats into a large bowl and add remaining cups of flour and salt; stir to combine. Add yeast mixture, egg yolks and oil. 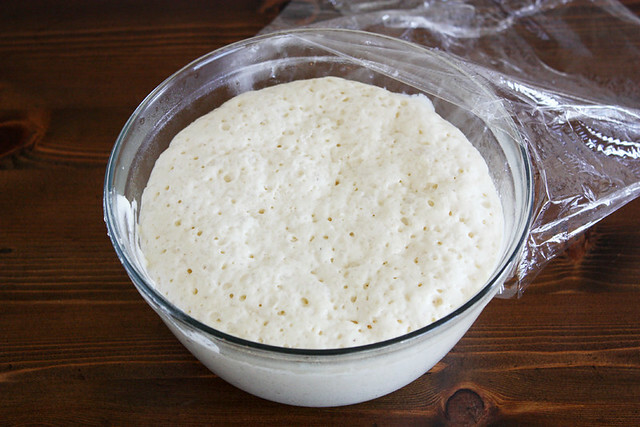 Add water and stir to combine (add more water as needed until dough forms, up to 1/2 cup total). 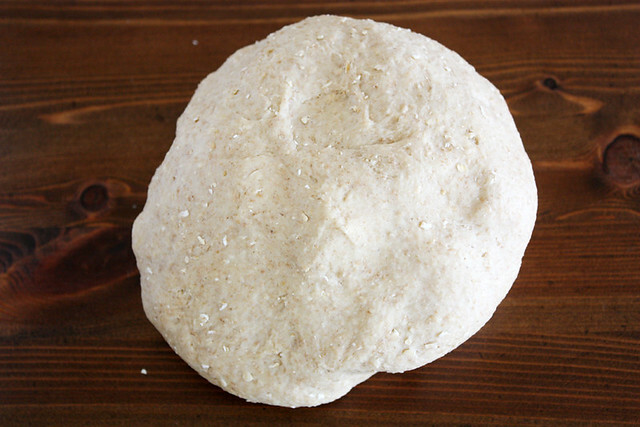 Knead dough with dough hook in stand mixer on medium speed for 3 minutes (or by hand on a lightly floured surface for 5 minutes) or until dough is smooth and elastic. 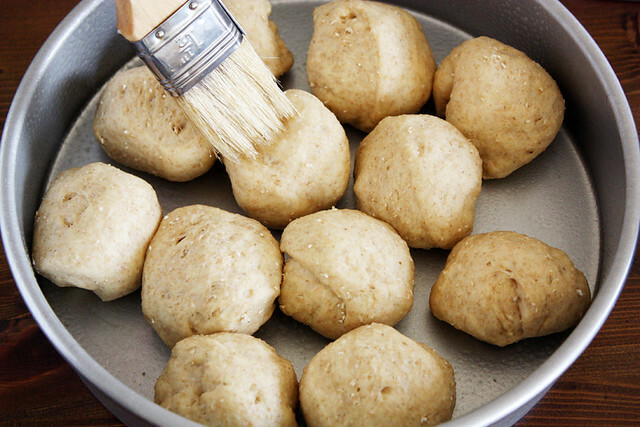 Shape dough into a ball; place in a well-oiled bowl. Cover with plastic wrap or a towel and let rise until doubled, about 1 hour. Preheat oven to 400 degrees F. Lightly grease two 9-inch round cake pans and set aside. 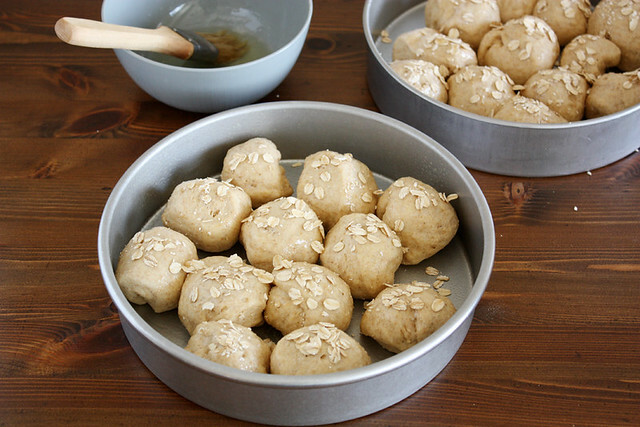 Punch down dough and divide into 24 equal pieces. Roll each piece into a ball. Place 12 balls in each cake pan about 1/2-inch apart. Cover with plastic wrap or a towel and let rest 25-30 minutes. Brush rolls lightly with egg white, then sprinkle with more old-fashioned oats (about 2 tablespoons). Bake until golden brown, about 25-30 minutes. Place pans on a cooling rack to cool slightly; serve warm. Disclosure: I received compensation from Gold Medal Flour for recipe development purposes. All opinions are my own. Val — LOL, sorry I’ve made you feel guilty! Those Target rolls are pretty darn tasty, too. 🙂 Merry Christmas! We’re celebrating holiday recipes this month on the Shine Supper Club and this would be a lovely contribution. I hope you’ll join us! I wanna grab one of those rolls and slather it with some salted butter. They look amazing! Definitely trying these. Rachel — Best. Idea. Ever. Thanks for the comment! you’ve inspired me! I need to start making my own dinner rolls. These sound amazing! 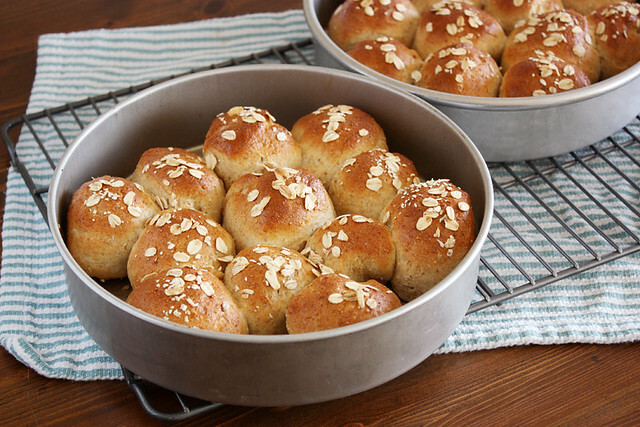 I did make some rolls for Christmas dinner & they came out great…but i love oatmeal bread, so am going to try these…i usually cheat & make dough in my bread machine…let him do all the work. Made these beauties yesterday night For all the wholesome goodness they contain, they turned out soft and very nice. Slightly salty for our palate but will reduce that next time. Thanks for sharing .